It has been confirmed that this Saturday at 2 P.M. EST, EDM artist Marshmello will be performing in "Fortnite" at Pleasant Park. Of course, "Fortnite" is an incredibly popular Battle Royale game that sees 100 players take each other on to fight and see who is the last man standing. There will be a special game mode created for the event that will allow users to respawn, as Marshmello performs a set live in-game, something that has never been done before. "Fortnite" is known for their skins and emotes that can be bought with the game's currency called V-bucks. 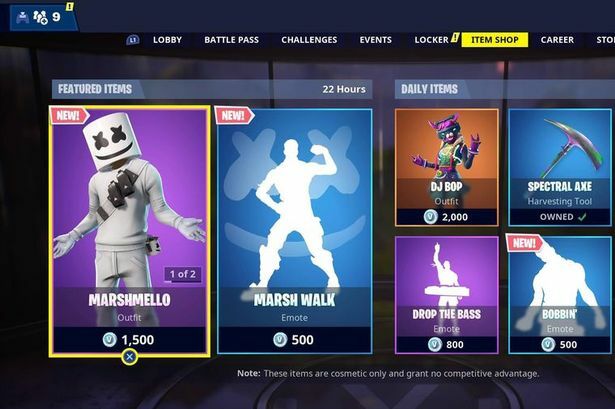 To commemorate this performance, there will be a Marshmello skin, a Marsh-Walk emote as well as a Marshmello-inspired glider. This kind of performance is unprecedented in any video game and specific details on how this will go down aren't completely available just yet. Epic Games has been known to do some cool activations within "Fortnite" in the past, so there shouldn't be any worries that it won't go down smoothly or as planned. Fans of the EDM artist who play "Fortnite" won't want to miss this event, especially since it will go down live and there won't be a second chance to see it.